How to choose the right Raspberry Pi model for your project. What Is a Raspberry Pi? In its simplest form, the Raspberry Pi is a credit card-sized computer developed by the Raspberry foundation in the UK. With its flexibility and simplicity, Raspberry Pi has gained its importance among professionals and enthusiasts alike. Why Was the Raspberry Pi Created? In the early stage of computers, the users were mainly programmers and enthusiasts who explored the device to extract more out of it. As computers became more popular and simpler, people started using it with pre-programmed software and games and the number of programmers and makers went down sharply. Observing this, the Raspberry Pi was designed to inspire enthusiasts and makers to cultivate a habit of programming. What Can You Do With a Raspberry Pi? There are endless possibilities for what you can do with this credit-card sized computer. You can interface all those sensors, motors, LEDs, LCD screens, and more with your Raspberry Pi. You can plug a USB keyboard and mouse into it and use it as a desktop computer. It can perform almost all the functions that a Linux PC can! You can even make your own dream computer that has no keyboard or mouse. Instead, you can use just a bunch of sensors to sense your motion and move the cursor on your screen. Where Can You Learn About Raspberry Pi? If you're an absolute beginner to Pi, you can get started with our free guide: “How to be a maker”. If you have already started with the Pi, then your next step would be to learn the Python script, which makes your Pi a lot sweeter. Out of these, the most commonly used and available versions are the Raspberry Pi B, Raspberry Pi B+, and Raspberry Pi 2. Since the original launch of the Pi, the prices for key components like the processor and memory have come down. This means you can achieve a higher degree of performance at the same cost. With this fact in mind, the team decided to take their model, the B+ variant, and give it a makeover. The new Pi2 is equipped with an ARM v7 that clocks 900Mhz and has a memory enhancement that doubled to 1GB. That’s it. Such a small upgrade may appear to be too modest to be worth mentioning. But in the world of the microcomputers, such changes are epic — especially when the prices don’t change. In terms of performance, these minor upgrades pave a whole new level of implementation, including the operation of high-level operating systems like Microsoft Windows 10. This is due primarily to the Broadcom BCM 2836, which replaces the former Broadcom 2835 SoC. The former single core 700Mhz Arm v6 processor is now replaced with the new quad core 900 Mhz v7 Cortex-A7 processor. However, there is a minor power consumption uptake and a subsequent heating issue if the chip is overclocked. Despite the changes that come with the new ARM v7 modules and Kernel, it will not obstruct compatibility with v6 user binaries and will support existing Linux distributions for the original Raspberry Pi. The Raspberry Pi 2 is “camera shy". This was discovered when photographed with a Xenon flash. In certain cases, the high intensity of the flash can cause a hiccup in the voltage flow, causing it to reboot. This problem is due to a photoelectric effect—when metals give off electrons when hit by light. This problem is easily fixed by putting a tiny opaque cover on the U16 chip between the power supply and HDMI port. Clearly, this flaw hasn’t lessened the excitement of Raspberry Pi’s dedicated following. Since the initial stock of the Pi 2 (1,500,000 units), were sold out in no time. The company continues to manufacture 20,000 computers per day to meet the increasing demand. 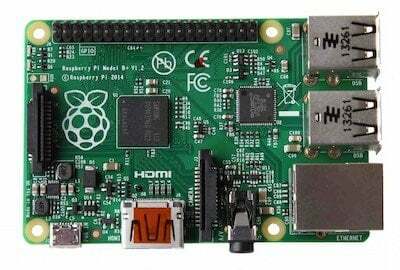 Of the three popular variants of the Raspberry Pi, the Pi 2 Version clearly has more features and is cheap compared to the rest. Considering all these aspects, we recommend the Pi 2 version for beginners.